With 61 Moths entering the Rolly's Brownies Moth Nationals this is the biggest Moth event in Europe this year. 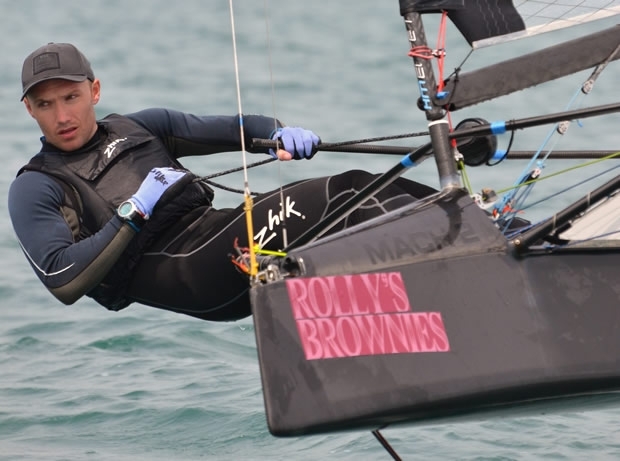 With entries from Germany, Belgium, France, Switzerland and New Zealand, the quality of the fleet speaks for itself, but not to be out done foil town Portland Harbour produced its best conditions, with 10 to 14 knots across the course on the opening day of racing. The race officer got the fleet away on time and cleanly in race 1 with all 61 boats on the line, this turned into a 4 lap race for the top fleet, a race which saw Chris Rashley make a school boy error and round the wrong leeward mark. Despite this Chris got back to take 3rd place with Simon Hiscocks 2nd and Rob Greenhalgh taking the first win of the day. Race 2 started in slightly fresher breeze but as the fleet was about to start with 30 seconds to go the wind shifted 15 degrees and the very competent race committee postponed the race to reset the marks. Finally the race got away and it resulted with a good mix of boats from left and right rounding the windward mark together. Close racing in the fleet is the norm these days with one of the sailors describing the pack of boats behind him like a pack of wolves waiting to pounce but once again Rob Greenhalgh sailed through to take the second race with Chris Rashley second and Ben Paton 3rd. Race 3 started on the second start after the first start was a general recall as people pushed the line trying to get clear in the 61 strong fleet, all seemed fine on the course but as the rain pushed in the wind started to die making it marginal foiling conditions on the third lap. This caused a large fleet to gather at the top mark before the breeze came in again with the key being to get on the foils as early as possible and nail every gybe in the lighter breeze. Rob seemed very at home as he made it 3 wins, Chris Rashley took 2nd and Mike Lennon 3rd. The class has come such a long way with 61 boats starting the first race and 61 boats in the final race and with 8 different types of boats in the fleet this is a great achievement. The only thing that breaks on a moth these days is the person sailing it.